Where do the Crescent and Tree come from on the South Carolina Flag? One of the original 13 colonies, South Carolina is represented by a star and a stripe on the 13 star U.S. flags. Asked by the Revolutionary Council of Safety in the fall of 1775 to design a flag for the use of South Carolina troops, Col. William Moultrie chose a blue that matched the color of their uniforms and a crescent that reproduced the silver emblem worn on the front of their caps. South Carolina needed a national flag after it seceded from the Union on Dec. 20, 1860. The General Assembly considered a wide range of designs, but on Jan. 28, 1861, added the palmetto to Moultrie's original design. The palmetto represented the colonials defense of the palmetto-log fort on Sullivan's Island against the British on June 28, 1776. A resolution proposing to change the color to "royal purple" as a memorial to Confederate dead was defeated in 1899, leaving the flag's Revolutionary War symbolism complete. 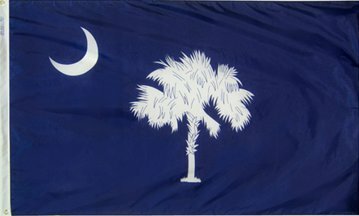 Actually there were SC flags with Palmetto trees on them prior to the Civil War. The SC Militia Act of 1839 specified flags of that type (sometimes on red fields as opposed to blue) and the Palmetto Regiment of the Mexican War carried flags of this nature in the mid-1840's. At the beginning of the secession period of 1860-1861 there were indeed a number of designs submitted to the state committee. For a detailed account of these flags please see "A Flag Worthy Of Your State And People" by Wylma Wates. This was published by the SC Dept. of Archives And History. Back in 1965, the Flag Bulletin published an article entitled "And the Ensign of South Carolina Shall Be ..." which stated that the legislature adopted a different Palmetto flag the day prior to the adoption of the present flag. It was blue with a crescent in the canton and a white oval in the center bearing a gold palmetto tree. Adopted 26 January 1861 and superseded on 28 January by the present design. This is definitely a cross between the Confederate and South Carolina flag. This is not an official anything. Ever since the movement to remove the confederate flag from the Georgia State flag, various flags have been made. I Ain't Coming Down, Heritage not Hate and "state" confederate flags. We sell the Confed/South Carolina and Confed/North Carolina. I suppose flags are a way of making a statement and some people are doing just that. I recently purchased a 3' x 5' South Carolina flag online and received a flag that looked like this one. The Palmetto and the crescent are different from the flag I have seen in various flag guidebooks and the FOTW website. Doing some further digging online, it appears that there is no standardized design for the SC flag. This is an image of the flag included in an article published by the Charleston Post and Courier in 2007 titled "What the heck is that doodad in our state flag?" The article was about the confusion regarding the crescent shape at the upper hoist. The Palmetto looks completely different on this flag. I haven't been able to find if there is a state law in SC that specifies the SC flag design similar to laws in other states, such as Maryland's Section 13-202 of the State Government Article of the Annotated Code of Maryland. There is a proliferation of unofficial variants of the South Carolina flag. Last year, I purchased a T-shirt with a SC flag halved red over blue, the demarcation from the lower hoist to the upper fly. The girl in the shop explained that the flag was the "Citadel Flag," which is news to me, but it's still a nice looking flag illustration. All-red Citadel or "Big Red" flags are available as are the red auto tags: these are widely sold and displayed. I am not certain of the significance for those that display them on their cars - if it intended as a Confederate symbol, a symbol of The Citadel or both. It may be possible that this is intended as a covert symbol of Confederate heritage in light of the removal of the Confederate Battle Flag from the SC capitol dome. I've also seen more of the latter flags being flown in SC since then. Similarly, the University of South Carolina seemed to have developed its own variation on the SC flag: One store had for sale a deep rose pink/lighter red over black SC flag also divided diagonally - in this case from the upper hoist to the lower fly. Another variation seemed to be for the Clemson fan: an all-orange SC flag that was available both as a flag and an auto tag. I thought I glimpsed this [red over blue] flag some months ago on a TV documentary about efforts to raise the Confederate submarine Hunley from Charleston harbor. A diagonally divided red and blue flag with a design that looked like the palmetto and crescent was flying from one of the ships supporting the operation. University of South Carolina = "garnet and black"
Clemson University = "orange and purple"
Other smaller universities often have their colors used in a similar fashion. The Citadel is an exception. They have "Big Red" which is a similar variant, but with a more historic significance since The Citadel is a military college, and it of course lacks the diagonal feature of the other colleges. The flag may have its origins around the time of the Civil War, but the use of "Big Red" and other universities' colors on vanity tags, flags, and other accessories is purely out of support for one's university. Other variants appear like pink and green, which I think is a sorority's colors. I'm not sure what the pink and red combination is, but I'm sure there is a logical reason for it. The red and purple flag that you have in your sample image appears to me to be a faded version of USC's "garnet and black" flag. The diagonal flag is totally a privatized commercial phenomenon, so it doesn't matter of the school itself is public or private. The official school athletic clothing will not show these things, so they can be hard to find. However, any school can conceivably make one if they want. I have seen them for schools like Limestone College (in Gaffney, SC) as a large billboard, and even Furman. I have searched around and I can't find any images online of the smaller colleges, but there is no reason schools like SC State and perhaps Benedict wouldn't have them too. It just depends on what kind of support the independent merchandise dealers get from those schools. I have attached several different flags (e.g. see here) and imagery to show how these emblems are used to represent schools in SC. These are particularly popular as "tailgate" flags that are attachable to cars. SC has no official state flag design, so flag makers make it up. That could change. Discussion at www.thestate.com to standardize the state flag. Article also picked up by the Post and Courier. A Senate panel approved a flag study committee on 7 February 2018, as reported by the Post and Courier. The state military crest, which is the crest used in the coats of arms of units of the National Guard, as granted by the precursor organizations of what is now the Army Institute of Heraldry. The official Institute of Heraldry blazon is "Upon a mount vert a palmetto tree proper charged with a crescent argent."